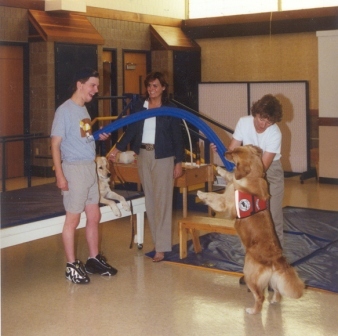 Therapy session is being directed by a Speech Therapist, Golden Retriever is directed by Carole Torgerson under the supervision of the Speech Therapist. The treatment modality is typically billed as part of client services. Therapy session is being directed by an Occupational Therapist. Golden Retriever is directed by Carole Torgerson under the supervision of the O.T. This treatment modality is typically billed as part of client services.